Formerly known as Château Brane-Mouton, it was in 1853 that Baron Nathaniel de Rothschild acquired the property located on the Left Bank in the Bordeaux region in the Médoc. From this date, the Château was renamed Château Mouton-Rothschild. Under the leadership of Baron Philippe de Rothschild, Mouton-Rothschild saw its reputation grow to become an emblem of the Pauillac appellation. Taking over the reins of the estate in 1922, Baron Philippe de Rothschild was at the core of all the major and innovative decisions during his time there. From 1924, Mouton-Rothschild was the first property in the Bordeaux region to bottle the wine on the estate and to mention this on its label. The barrel storage capacities on the estate quickly become insufficient. The "Grand Cellar" at 100 metres long was designed in 1926, and was an architectural feat at that time. In 1973, Château Mouton-Rothschild acquired the rank of Premier Grand Cru Classé. With the same passion and commitment as her father, the Baroness Philippine de Rothschild took over in 1988. Up until 2014, the estate had its facilities further expanded and modernized, which has left a profound mark on the estate. Today, the three children, Camille Sereys de Rothschild, Philippe Sereys de Rothschild and Julien de Beaumarchais de Rothschild, all co-owners of the château, continue in the footsteps of their predecessors. Château Mouton Rothschild overlooks 90 hectares of vines and is established on an exceptional terroir. The château takes its name from the fabulous gravel outcrops resting on a marl-limestone soil. In ancient French, the word for a mound of earth was "mothon", and then it became "mouton", the name which now adorns the château. With typical Médoc vineyard plantings, Château Mouton-Rothschild's signature is that of the emblematic black grape of the Left Bank. The Cabernet Sauvignon represents 81% of the vineyard plantings and has built the identity of the estate’s vineyards. Splendid and racy, Château Mouton-Rothschild's wines have an inimitable style that are recognized by purists from all over the world. The power and richness of the aromatic palette are revealed in a complex and refined bouquet. This bouquet offers notes of black fruit and blackcurrant, and then it evolves into spicy notes like vanilla and smoky scents like incense and cedar. With monumental structure, the palate reveals a fleshy mouthfeel enveloped in tannins. The length of the finish with its minerality and dazzling refinement further displays the power of the wine. Since 1945, Château Mouton-Rothschild is associated with an piece of artwork. 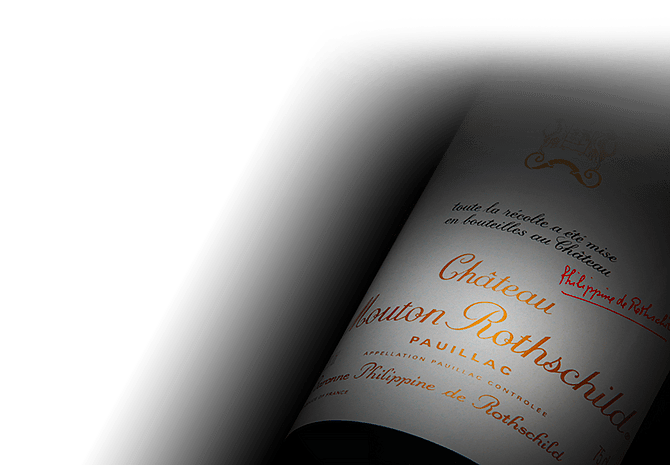 Each new vintage from the estate reveals a new label that is a reproduction of an original contemporary artwork that is solely created for Château Mouton-Rothschild.